Comfort, simplicity, speed and variety of recipes ... ..to simplify cooking food default babies and mothers life, have gathered thousands of ideas, we combined and ASTEL was created ingenious Nutribaby. Diversification is an important stage in the development of babies and nutritional values of food preservation is essential to the harmonious development of the baby. Kitchen robot includes five distinct functions: Bottle heater, sterilizer, steam cooking machine, blender, and defrost function / reheating food. Nutribaby turn cooking into a very simple and fast! 1. Bottle Sterilizer Nutribaby steam sterilization function is most effective in killing all germs. Sterilization function can be selected easily on dispay the camera and does not involve adding any chemical additives. Can be sterilized up to 3 bottles universal, teats, and other accessories. At the time when the sterilization process is complete, the device will emit a beep. The time of sterilization is reduced. 3. Apparatus for steam cooking The baby healthy cooking method, can be done easily and quickly thanks to NutriBaby. All foods will keep both vitamins, flavor and taste. The device allows the separation of food according to their cooking time required. Thanks to the tray removable device allows adjustment necessary cooking space. (So you can cook a small amount of food or higher) User Manual provides a table with food cooking time required (time is approximate and depends, for example, and the size of the pieces placed in the unit). For example carrots cook in 16-20 minutes, beef in 8-10 minutes, etc. 5. The function of de-freezing Nutribaby allows de-freezing of food through the touch of a button. 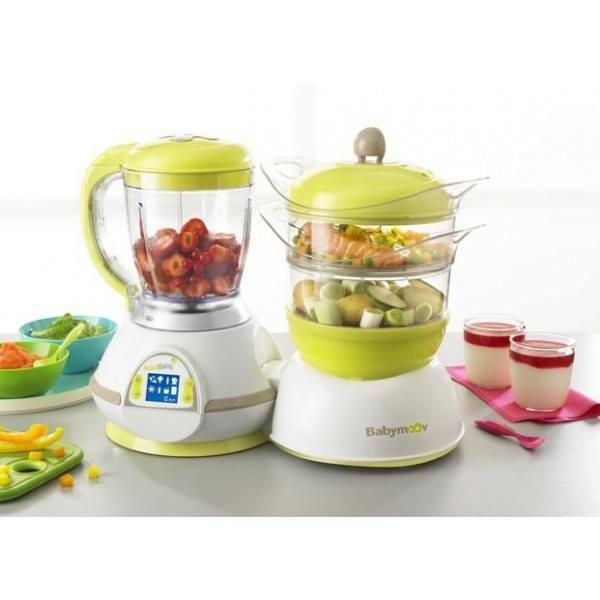 Maximum capacity: 1500 ml cooking and blender 600 ml User Manual indicates the time necessary for preparing each food group.